This shoot was unlike anything I've ever put together and I had the best team of vendors to do it. Check out at the bottom to see everyone involved and follow them... right now! I am so glad to finally share this amazing shoot with you because it has been featured on TWO different blogs! Check them out here and here. 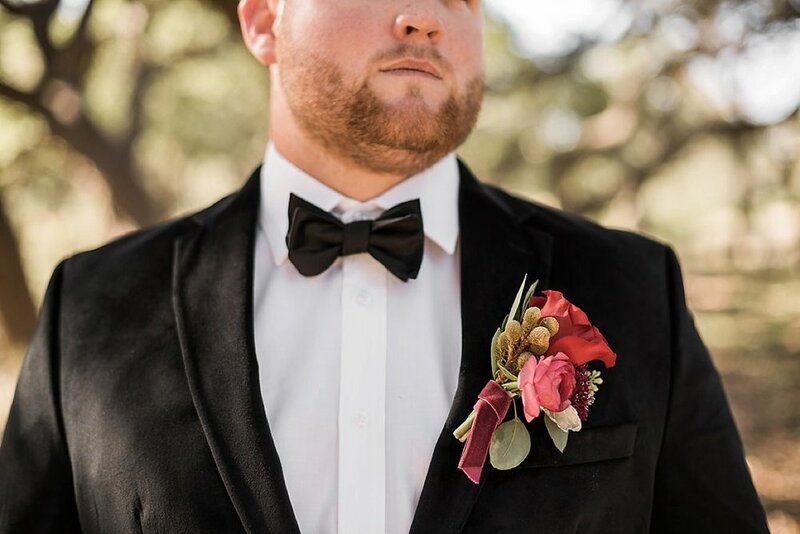 This Hill Country woodland styled shoot is great inspiration for brides having fall weddings this year, which is right around the corner, and for years to come! 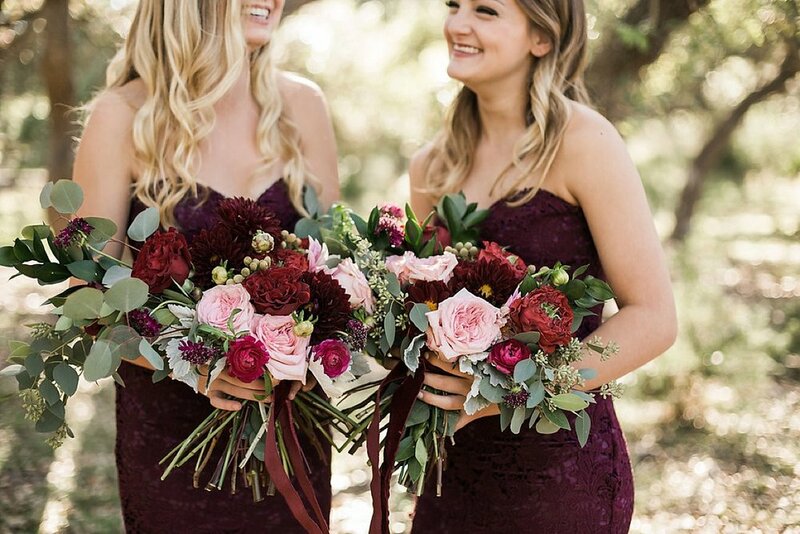 The deep burgundy, red, plum, and pops of copper are a great departure from the traditional oranges and browns you see in a lot of fall weddings. After months of curating this shoot, we knew we wanted to create something different. Something that is unusual to be seen on a wedding blog. Something that hadn't already been done. In this day and age, it's hard to find things that aren't straight out of Pinterest and are truly original. As fall quickly approached, we knew this was going to be a darker, more romantic shoot. 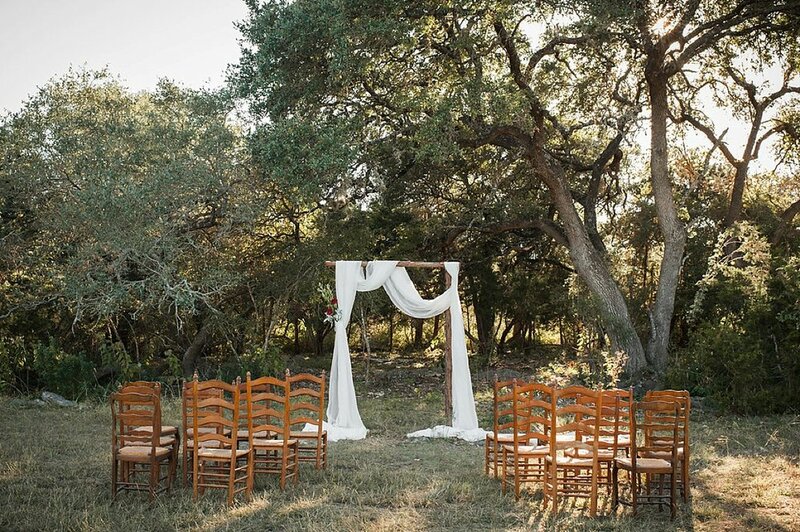 This is where we present to you the Hill Country Woodland Chic Inspired Wedding. 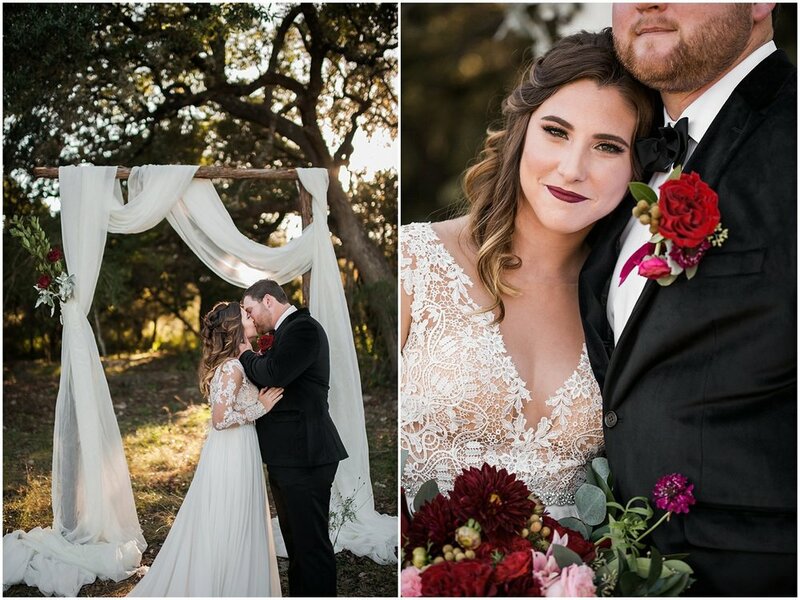 The color palette of burgundy, red, deep plum, and pops of copper exaggerated the thought of love in the air, especially with this gorgeous couple. This is by far the most talented group of vendors I have worked with. The gorgeous dress was from Bella Bride Boutique that the fellow photographer, Taylor Gevelinger with T Walker Photography, actually hand picked with the owner of the boutique, Alexandra Mimari. We went with the new trend of body suits and a gorgeous, flowing skirt to match. Jax & Olivia with JAX Studio in San Antonio did an outstanding job with hair and makeup! A deep burgundy lip and soft, romantic curls were exactly what this dress needed to bring our vision to life. Not to mention, they offered a beautiful studio for our model to get ready at! The tables and chairs came from the amazing Farmhouse Market in Spring Branch. After carefully picking out exactly what we wanted to set the scene with, Kaitlyn helped us find the perfect, unique pieces in her store. The cake table was from CRU Vintage Rentals and they were so gracious to lend us the gorgeous wood table for the shoot. Ashlyn and Cara with The Petal Post went above and beyond with the florals. I mean just look at them! 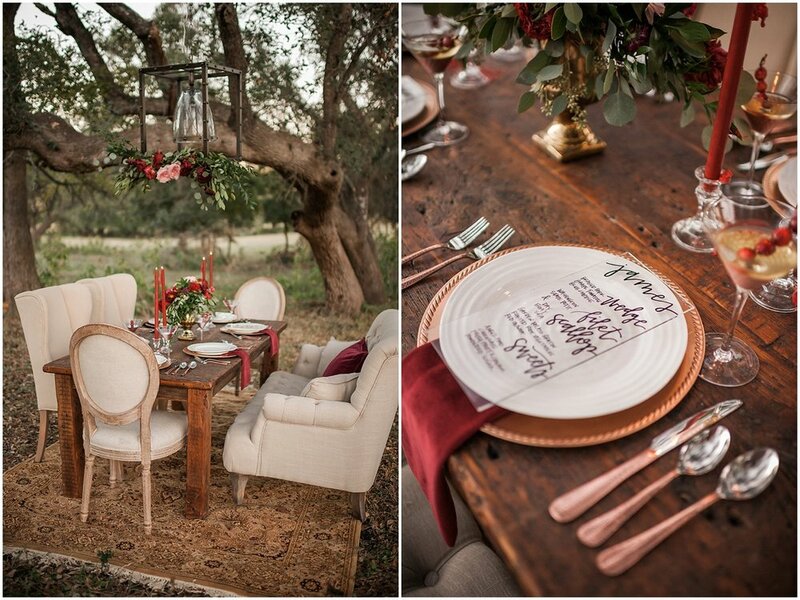 My favorite item was the hanging lantern above the table that really set the romantic mood we were looking for. All of the sweet treats came from April with 2tarts Bakery in New Braunfels. In addition to the main wedding cake that presented extravagant editable flowers and a color pallet to match, she created an entire dessert bar with a yummy treat to match anyone's taste! Lyndsey Moore with Paper Napkin Press provided all the calligraphy and paper goods. Literally, everything she created was so unique! From the burgundy, velvet envelope inlay to the acrylic menus and the absolutely stunning sign that she created with matching burgundy velvet tassels; she went above and beyond. She really knew what we meant when we told her we wanted to create things not found on Pinterest! 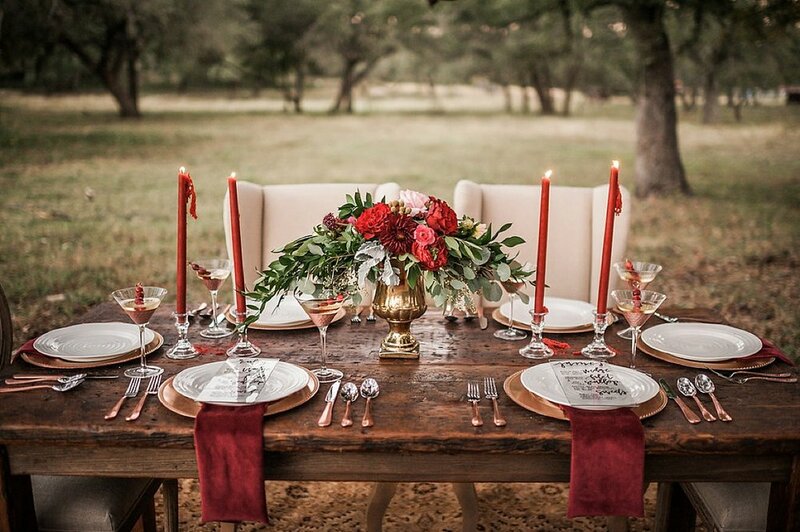 We couldn't have done any of this without the amazing help from Halima Hanemann from Lively Events in New Braunfels. 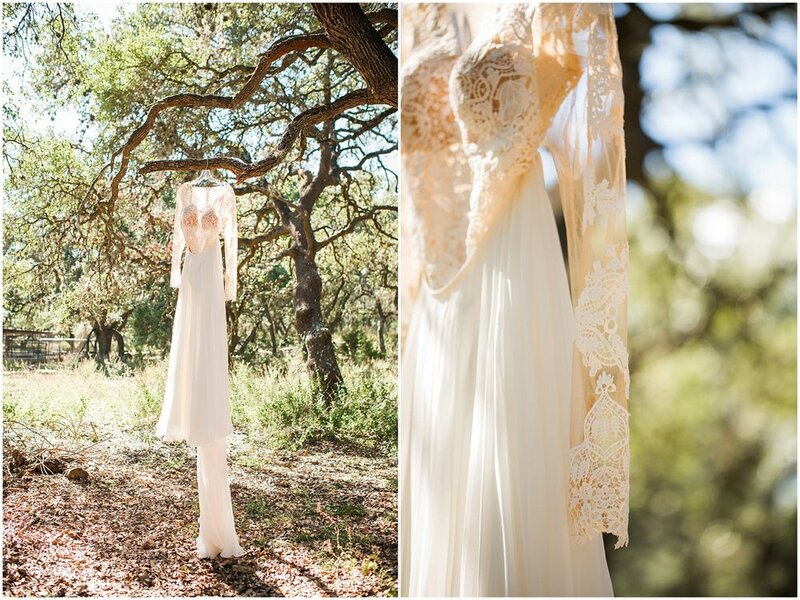 From beginning to end, she helped organize, style and bring our ideas to life with this shoot! The beautiful images that you see were from the creative photographer duo of myself, Abbie of Abbie Mae Photography and Taylor of T Walker Photography. Even though I'm no located in Dallas, you can find us working together often in the great city of San Antonio and around Texas!